Floating down the canal on a school bench isn’t what I usually do on a Tuesday evening. I am starting to wonder why because it turns out it is a very pleasant activity. Tameside looks completely different from the canal. You get to see some wonderful hidden bits of nature and people wave at you from their gardens. As I drifted under a few motorway bridges I tried to imagine where I was in Tameside but I wasn’t sure. All I know is that I am on my way to Droylsden on an eighty-eight year old boat called ‘Forget me not’. I want to call it a barge but I’ve slipped up with this before, this is a narrow boat. Even though it only has a house bit at the back. This is a narrow boat because it is narrow. Barges are wider. The school bench is perched on top of it. The boat is a wooden boat and I know this because Chris Leah from the Wooden Canal Boat Society is chatting to me as I travel. Telling me the wonderful story of how his passion for boats became the charity it is today. From living on a canal boat as a student in 1974 and buying his first boat Lilith for a £100. Lilith is still owned by the society along with five other boats. Lilith was born in 1901 making her well over 100 years old, although many parts of her have been restored. Plenty of the boats have sunk and been brought back to life. Including one Chris was living on. One important way that the society raises money to restore these beautiful boats is through their recycling trips that depart from Portland Basin on the first Sunday, Monday and Tuesday of each month (apart from Bank Holidays) to Fairfield Junction in Droylsden. This was where I was headed. As we turned around and moored, I leapt off, a little warily because I had once fallen in the Thames trying to jump off a boat. I was perfectly safe on this occasion. I was handed a jacket, gloves and a wheelbarrow and headed to the streets of Droylsden. I have experience of this because I had helped out with the Hyde and Ashton Rotary Santa float. It was just a case of knocking on the door and asking if there was anything to collect. Just the same, except this time it was clothes and bric-a-brac for the Wooden Canal Boat Society Shop based on Stamford Street in Ashton. People were very friendly and knew who we were. The recycling trips had being happening for nearly 30 years since starting in 1996. The society first had a market stall and then graduated to a shop. Some of the male volunteers got donations to put in their wheelie bins and I came over to find a very delighted man who wanted to get rid of lots of things in a summer clear out. With wheelbarrows and bins full we returned to the canal to pack up and cruise home. It was a very pleasant evening and we enjoyed a cup of tea on the boat as I took my place once more on the bench and travelled back along the canal. 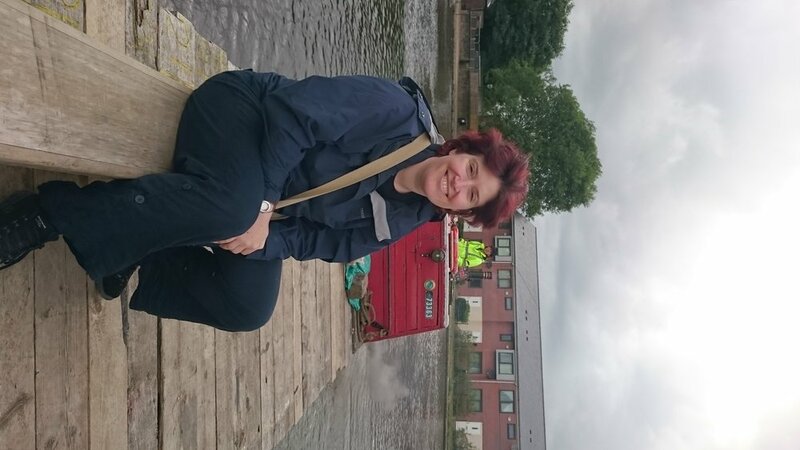 I returned to see the society on Wednesday at Portland Basin where they restore the boats between 10am and 3pm. Volunteers come and learn about restoration and apply lashings of paint to keep them in good condition. I met Hazel who started as a volunteer at the Wooden Canal Boat Society and now works with them as a volunteer coordinator. It is a little bit confusing as Hazel is also the name of a boat the society has restored as a ‘well-being’ boat to provide trips and respite to the people of Tameside who most need it. It is lovely spending time on the boats and there are plenty of things to do from learning how to crew them to raising money for their upkeep. I did my bit by painting a sign to hold information about the boats for people visiting Portland Basin Museum. People volunteer for the society for different reasons, some because they are lonely or excluded from society in some way, others to give something back or do something new they enjoy. You can find out more about the boats on their website www.wcbs.org.uk where they explain how they make ‘new lives out of old boats,’ by giving people’s lives meaning and structure through volunteering and bringing heritage back to our local waterways.